Purchase glow in the dark necklaces in the Visitor's Center! Join us for a journey through the dark forest in an array of colorful light! Our hay wagon will pick you up at the Campground Activities Shelter at 8:45pm and then at the Visitor's Center at 9:00pm then off on our hike! $5 parking. 229-276-2371. We will be having a special Ranger-led hike in to the two mines off of the Iron Hill Trail. It will be a moderate hike and we will be going off trail into the mines, as well as on top of where they meet! Please wear good footwear and bring water. Call to register. Inclement weather may cancel event. $30 plus $5 parking. 770-975-0055. Come experience the historic Camp Lawton at night via lantern-light in this guided historical tour. Be transported back in time as you hike the trail and learn about the world's largest prison stockade and its inhabitants. Participants get to carry their own lanterns. You may even see a Confederate soldier and hear a musket fired. $10 - $15 plus $5 parking. 478-982-1660. 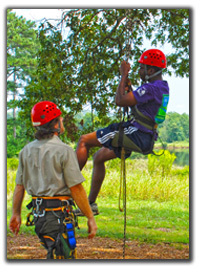 Kids age 10-14 come out and enjoy 3 days of outdoor adventure on May 29 - 31 and/or June 12 - 14. Camp includes coastal kayaking, fishing, hiking, archery, beach coming on Cumberland Island, environmental education and more. Space is limited to 10, reservations required. $115 plus $5 parking. 912-882-5256. Participate in this nationwide effort to take care of our trails. Join a Ranger and hike around the Lake, Goldmine Creek, and Gahuti Trails. The hike will take around 2 hours. We will collect trash as we hike. Bags, gloves, and pickers will be provided. Meet by the beach There is no charge for this hike. Please bring a snack and water. $5 parking. 706-422-1932. Enjoy a 2 mile out and back guided hike along the Helen to Hardman Heritage Trail. This hike will lead you through several layers of history in White County, as well as the natural history of the Chattahoochee River. Meet in the Visitor Center. $5-$12. 706-878-1077. Grab the first clue at the Visitor Center to crack the code for the scavenger hunt adventure on the White Oak Trail. This 1.25 mile trail will led you around the Temple Mound and have you searching high and low for the answers. Please wear closed toe shoes and bring bottle of water. $5 parking. 229-724-2150. Join us to celebrate National Trails Day hike at our park, bring water and insect repellant. The hike is a 1.3 mile hike. Pre-Registration is not required for this event. $5 parking. 912-297-4900. Calling all Jr. Rangers. Come celebrate National Trails Day at Unicoi Come learn about trail blazes, what to bring on a hike and hike our bottoms loop trail with park guides. $5 per hiker $5 parking. 706-878-2201 ext. 549. Volunteer on National Trails Day and help maintain the hiking trails at your favorite park. Bring your gloves and water bottles to the park office to get started. $5 parking. 706-245-6270. Join us for a Ranger-led hike to the Lower Overlook. As you stroll along the banks of Antioch Lake, we will share this area's unique history, flora and fauna. Once we arrive at the Overlook, the Ranger will discuss the unique Rocky Mountain Hydroelectric Plant. The trail is considered easy. Please meet in the Visitor Information parking lot. $5 parking. 706-802-5087. Put on your hiking shoes, bring a flashlight, and join us for a full moon hike in the Wormsloe maritime forest. Get a rare glimpse of the twilight and night time wildlife that make Wormsloe their home. The hike will start at the Visitors Center and be approximately 2 hours on a 3 mile trail. $4 - $12. 912-353-3023. Are your kids looking for a little adventure, and fun learning this summer? This 3-day camp geared toward ages 6 - 9, runs from June 18 - June 20 (9 am-1 pm). It includes tons of outdoor recreational and educational opportunities such as: hiking, fishing, canoeing, nature art, and more. Registration opens on Monday April 15th. $60 for one child $50 per child for two or more $5 parking. 706-557-3001. Historical, environmental and recreational education and activities are on the program in this one-day camp at Roosevelt's Little White House. For children ages 8 to 12. Please call to sign up. $20 Student - $12 Parent No special passes honored on program dates. 706-655-5870. Tired of the same old summer camp? Looking for some adventure this summer? We have the solution! If you’re interested in archery, bouldering, tree climbing, outdoor living skills, and more, this is the camp for you. Ages 10-14. $200. 770-389-7801. Children will participate in activities that focus on the outdoors, some activities include fishing, kayaking, trail walks, birding, and more. Space is limited and registration is required. Please call the Park Office to register. Ages 8-12 years old. Class limited to 10 kids. $40 plus $5 parking. 912-287-4900. Come to the park and join a park ranger as they led activities designed to help you earn your Junior Ranger badge. The activities will vary depending on the day. $5.50 - $7.00 706-624-1321. We will be hiking on the Iron Hill Trail to find the extraordinary plants that grow there! We will learn their amazing historical uses. Bring your Grimoire or notebook to record our amazing findings and make up your own potions. $7 plus $5 parking. 770-975-0055. Learn the ropes of outdoors exploration. This camp for 10 -15 year-olds will teach basic navigation, backpacking, archery, wilderness survival skills, and more! Space is limited, so please send in registration forms by June 25th. Please call the office at 706-245-6270 to register. $130 plus $5 parking. 706-245-6270. Are your kids looking for a little adventure, and fun learning this summer? This 3-day camp geared toward ages 10-12, runs from July 9 - July 11 (9 am-1 pm). It includes tons of outdoor recreational and educational opportunities such as: hiking, fishing, canoeing, nature art, and more. Register in advance, space is limited. $60 for one child $50 per child for two or more $5 parking. 706-557-3001. A Bioblitz is a communal citizen-science effort to record as many species within a designated location and time period as possible. Participants will learn the basics of identification, how to use the iNaturalist app, and will receive a summary of the Bioblitz's data. On the second day, we will explore the park and log all the species we can. $5 plus $5 parking. 706-878-3087.